NOTE: Please do not order this product if you are having your order delivered outside the continental United States. We love this varnish. If you want the best available in a natural oil and resin spar with a high solids content that relies on the more expensive (and far superior) polymerized tung oil rather than on linseed oil or other less desirable fillers, then just buy this varnish. This is the spar that is used on the wraps of every Golden Witch cane rod. We have been exceptionally happy with the results and so will you! Works for dip finishing as well. Please check out the long-winded ramble on Transparent & Translucent Wraps. And we just added another ramble on Inked Signatures and the need to over-varnish the ink. OLD VARNISH: Hey, if you’re like many rodmakers, you make more stuff than just fishing rods. In our shop we happen to make a fair number of bird feeders and birdhouses, some for the yard, some for FFA & Boy Scout projects. “Old” spar varnish is a wonderful thing for sealing outdoor projects that range from feeders to picnic tables to wooden planters. Because we’re insistent on selling fresh varnish for high end, finicky projects like fine bamboo rods, we wind up with some expired varnish on our shelves – varnish that is still functional for your rougher needs. My favorite “off label” use for good varnish to to cut it 50% or more with turpentine and use it as a sealer on freshly sanded butcherblock maple benchtops. The standard finish for BBM tops is mineral oil….that’s all well and good for your kitchen surfaces, but around rods you’re liable to contaminate a strip of bamboo prior to glue-up, or mar unfinished silks, if you have an uncured oil finish on your benches. Soaking ultra-thinned Sutherland Welles spar into the surfaces (that’s every surface, top, bottom, and edges) will help to keep your heavy benchtops from warping & splitting, plus it’ll make clean-up easier. Most of the benches in the GW shop have been re-sanded and sealed at least once so far, but the ones that see rougher use are refinished every few years. If you’ll promise not to use it for rodwork, and not to fuss at us when you discover that there is a lump, or a clump, or another defect natural to expired varnish, we’ll gladly sell it to you for half off of retail when we have some. Send us an email and we’ll create a Paypal invoice; UPS Ground shipping rates apply; Continental U.S. deliveries only. More On Old Varnish – As It Relates To Discovering An Old Can In Your Rod Shop…. This is modified & expanded from a response I emailed to one of our clients who asked about using a can from 2012…. I’m going to give you something of a split response and emphasize that the final choice is yours entirely. On the one hand, as an authorized reseller for SW, I am going to start by emphasizing that you should not use varnish that is well past its “best by” date. Varnish is one of these things where technique matters as much as product – good technique coupled with good product yields good results. But because even the best product, when used inappropriately (say, by applying overly thick coats, or by thinning more than 10% by volume), will give poor results, there is no absolute guarantee that SW will work in your application. That’s why test finishing, to prove out your methods alongside the product, is essential – even with brand new varnish. But if you use stuff past the expiration date and then lodge a complaint (not saying you would, so don’t take me wrong…I’m writing generally because this is the sort of response that is likely to land on the website … and here it is! ), that complaint will fall on particularly deaf ears, here at GW and with the manufacturer. There’s a reason the manufacturers take the time and effort to tag their products with “best by” dates. Varnish, like milk and cold cuts, has a shelf life. You wouldn’t want to drink sour milk or eat ‘rainbow’ ham, so you probably don’t want to varnish your finest work with material that isn’t fresh. Next up to ponder, since you do have an old can, is an overarching term: storage conditions. If your varnish sat for four years in a garage or other space that ran up and down in temperature seasonally, I’m going to suggest that you not use it. I wouldn’t. At least not on fine tackle. Buying a new can is expensive, sure, but not nearly so expensive that it’s worth ruining the labor you’ll have invested in wrapping all those guides. If, on the other hand, your storage conditions were in the basement, at a relatively stable 55-65*F, then I won’t tell you, sight unseen, that your varnish is ruined. You need to judge that for yourself. Open the can and pour it into a mason jar. Slowly. Look to see if the varnish has separated into layers, developed any inconsistencies in color or viscosity, and so on. If it has gone south, admit it, buy a new can, and save yourself the considerable headache of needing to re-wrap. If the stuff looks good, consider yourself fortunate. But make some test wraps and go through your entire finishing process on those test wraps. Prove this batch of varnish before working on an actual rod. 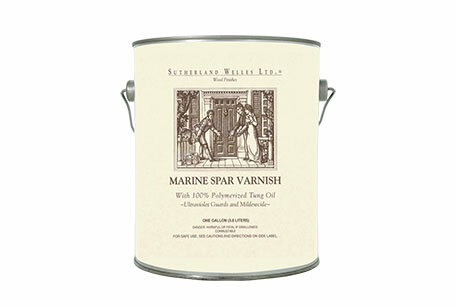 This takes a little bit of time and effort, but it’s exactly what you should be doing with a new can of varnish, too. If the varnish isn’t ideal, you don’t need to pitch it. Old varnish, re-stirred and mixed about 50/50 with turpentine makes a wonderful sealer for butcher block maple benchtops…work surfaces, not food prep surfaces. Old varnish is perfect for sealing picnic tables and birdhouses, too. Recently we’ve been seeing a rise in folks using old varnish (still “good looking” but past expiration) as part of their recipe for soaking & sealing furled silk flylines. In other words, even old varnish is useful, but useful where clarity isn’t your penultimate concern (protection being your ultimate concern). So, my best advice to study the contents of your can of varnish, perhaps going so far as to make and finish a few test wraps, then make a good decision that balances the expense of a new can of varnish against the risks inherent in using old varnish. If you determine that the risk is low, go for it. If you’re worried, we have good varnish in stock.